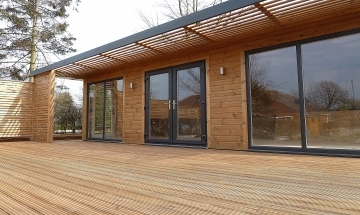 Thermowood is Scandinavian softwood timber that has been heat treated and with lower moisture comes higher weather resistance meaning that it is ideally suited for use as exterior cladding. This proved to be the material of choice for Bespoke Cabins and Summerhouses who build stunning cabins, garden rooms and summerhouses. They can build to a customers own plan or design it for them, each cabin is totally individual. The image shows a new design that Bespoke Cabins and Summerhouses have just completed near Wakefield in West Yorkshire. This is a 7.5m x 4m fully insulated 50mm x 100mm PSE timber frame construction. It has a 12mm external ply liner, TYVEK membrane and cavity battens, it is cladded in 18mm Thermowood supplied by us at Bennetts Timber. The cantilevered overhang, deck and fencing are also built using Thermowood timber. Windows and doors are 28mm toughened double glazed units, the interior is plaster finished and full electrical/lighting installation is included. If you are interested in Thermowood or any of our other cladding materials, such as Siberian Larch or Western Red Cedar please call our sales team on 01472 350151.